Where can I buy Marble looking truffles? Inspired by the marbles of his boyhood, French Chef and twice elected “Best Craftsman in France”, Yves Thuriès dreamed up the idea of a chocolate like no other: Exquisite Chocolate Marble Truffles. Glazed and polished to appear just like an actual marble, each truffle has its own distinct and unique filling. With seven different colors, recipes, and fillings, each truffle promises to be an individual experience like no other. Exquisite Chocolate Truffle Marbles filled with delicately flavored chocolate come in the following delectable flavors: Milk Chocolate and Crispy Cookie, Milk Chocolate and Crème Brûlée flavor, Milk Chocolate and Nougat flavor, Milk Chocolate and Hazelnut Praline, Dark Chocolate and Caramel, Dark Chocolate and Passion Fruit, Dark Chocolate and Raspberry! Get your marble truffles now! For less than $20 ! 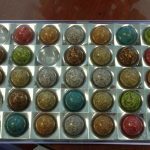 This entry was posted in Anything else and tagged marble, marble chocolate, marbles, marbles truffles on March 11, 2017 by WhereCanWeBuy.